Former head of the SBU Security Service of Ukraine Oleksandr Yakymenko and ex-Interior Minister Oleksandr Zakharchenko were the principal authors of the plan to disperse by force the Maidan protesters February 18, 2014, according to National Security and Defense Council Secretary Oleksandr Turchynov, who spoke with Censor.net. "Basically, [the authors of the plan] were Zakharchenko and Yakymenko. We had information that Oleksandr Yanukovych – Viktor Yanukovych’s elder son – was working on this plan along with them. But, in fact, that those two plus a commander of the Internal Troops [of the Interior Ministry] were the ones who were responsible before Yanukovych for the carnage on the Maidan," Turchynov said. “Nobody could give the command to go and meet their deaths. The Maidan by that time was living its own life and did not need any headquarters or any decisions of the opposition leaders," said the NSDC secretary. Read alsoYanukovych dreams of returning to Ukraine to do "something good"Turchynov also noted that no negotiations were held with Viktor Yanukovych after February 18, 2014. "There was no sense to hold such negotiations. They failed to seize the Maidan overnight February 19, and it became clear that it was a breaking point, that was our victory, which completely changed the balance of power. They cannot beat us! Already in the morning, people started arriving from the regions, and those living in Kyiv were also coming in. Everyone was in the mood to win. A little more effort, and the regime will fall," said Turchynov told. 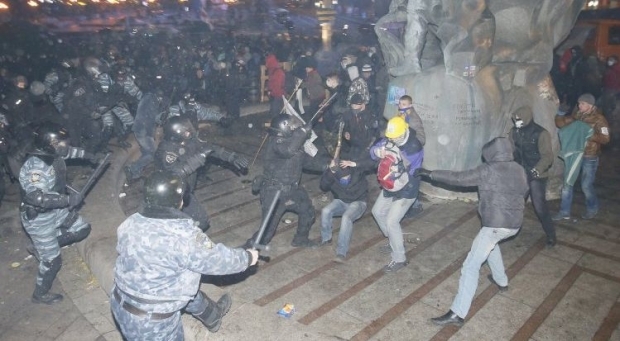 Read alsoRussia trying to destabilize Ukraine on EuroMaidan anniversary – PoroshenkoAs UNIAN reported earlier, February 18, 2014, mass clashes began between the Maidan protesters and security forces, which resulted in dozens of deaths in Kyiv center.